Not that the Brits were strangers to curry. Several London coffee houses offered curries alongside their more usual fare, and in the houses of returned colonials, the cooks were encouraged to added curry to their repertoire. 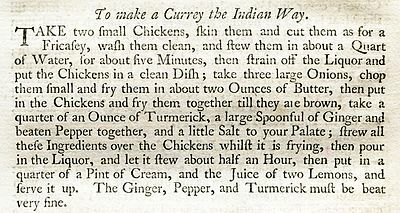 They may well have followed recipes like the one above, from Hannah Glasse’s best selling The Art of Cookery, first published in 1747. The twentieth century saw an explosion in the number of Indian restaurants and there are now around 9,000 across the UK. The advertising hasn’t changed much with curry houses like the New India (“the first and oldest Indian restaurant in Bromley”) which since 1965 has been tempting diners with “an unrivaled range of authentic & imaginative foods .. only using the best quality & freshest ingredients”. Apparently Taj Mahal is the most popular name for an Indian restaurant followed by Taste of India, Maharaja, Akash, Spice Lounge and Monsoon. The Plaza hasn’t featured in any list I’ve seen but then perhaps there was only one Plaza. When I was a student in Manchester in the late 60s it was legendary. This was just before stories about Rushholme’s ‘Curry Mile’ started to turn up in Sunday colour supplements.The Plaza lacked the kind of sophistication whch would win the approval of critics like Fay Maschler and Jay Rayner but it had the twin advantages of being very cheap and open till 4am, and was also near several university halls of residence. Because of this it was frequently packed with students who had drunk too much cheap beer in the union bar. The speciality of this small Somali café, run by Charlie Ali (possibly Mohammed), was Chicken Biryani which came with very yellow rice, raw onions in a tomato paste, and a ‘special’ sauce. Whether it was actually chicken was always a good talking point, but since one portion piled high on an oval plate was more than enough for two people nobody worried too much. Whether I can actually recall the taste of this urban delicacy is open to doubt of course, and the years have endowed it with a flavour which it probably did not have. 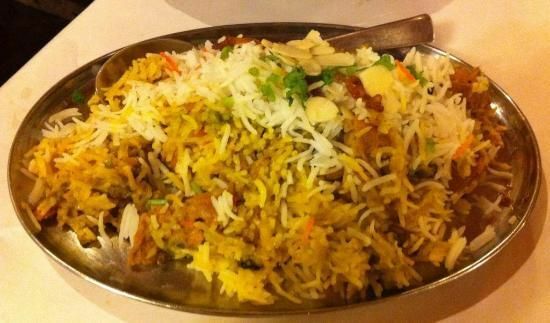 But no chicken biryani I have tasted since has ever lived up to that memory.